Planning your next recruitment cycle? Meet Conduit, an online re-engagement platform for universities around the world. I had the pleasure of working with this product when I worked for University of East London. Back then the main purpose of the platform was to engage with a larger volume of students online, host webinars for the international audience and ember a chat tool onto the university page. Platform Q, Evolved And so should you! Here at Friesland Collective, we are lucky to be Official Partners of Platform Q Education and can help you sample this invaluable product for free, with our help. 1. keeps your leads hot. It allows you to re-engage with your leads from anywhere. Whilst busy on the student recruitment road, it's often very difficult to re-engage with all those leads you met at the NACAC recruitment fairs. Often universities have a system where they send their leads lists to their marketing teams at home. But students want to hear from YOU. They met YOU and YOU are the reason they are thinking about this institution. My aligning your webinars with your travel schedule, you can pop online for 30 - 60 minutes and invite all those students to ask further questions. Once you gather more information on your prospect students, you have the ability to pass these leads on to relevant departments and keep these leads hot hot hot! When working in a small recruitment team, marketing your content <<<on time>>> is always a struggle. You are happy to do a webinar but you don't have the time to engage an audience and post content weeks in advance. Often your event turnout struggles but you get a couple of students interested so it feels like a win. It can be a true home run if you take care of this process with the help of gurus at Platform Q. 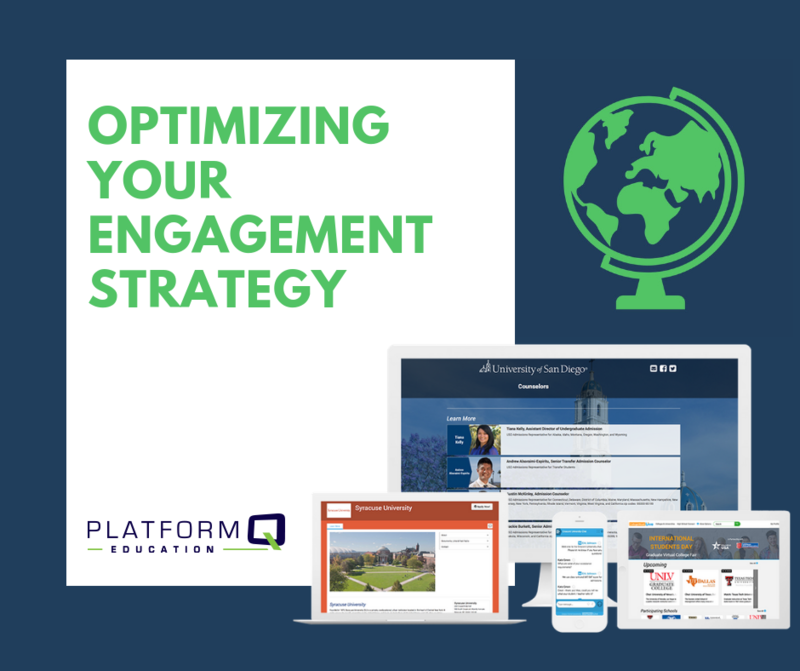 Platform Q Education ensures that your content is shared on all relevant social media channels with a targeted following aka busy high school students! Any webcasts done on their platform is simultaneously posted on Facebook live. Quality of lead prospects is very important. This is why we all like NACAC fairs right? You get to have a jolly time scanning barcodes of students rather than having them fill out long forms AND you get all the data afterwards in a neat spreadsheet! With Platform Q you get that and a little bit more. Along with a very detailed description of all your leads, it provides monthly reporting on your prospects. When it comes to converting leads, all communication efforts should be segmented and knowing how many times 'student x' visited your page is very useful and separates the 'keen' from the 'just browsing' prospect. Think about all the ways you can use this type of data. Video content is king. It's the next best thing a student can see, apart from your handsome selves at a recruitment fair! Not all content has to be recreated, especially when it comes to video content. Platform Q allows you to repurpose the content and recycle your videos cycle after cycle. PRO TIP: do not include prices into your webinar slides if you aim to recycle your videos. High School counsellors are getting more creative about ways they expose their students to a variety of universities. They are also first to tell you that they are not very familiar with overseas admissions processes. Platform Q has features that allow you to schedule presentations with high school counsellors and their prospective class. Some counsellors are now hosting virtual college fairs on the platform. A fantastic opportunity for you to save your resources and virtually represent your school from the UK! Drop your details below and let's get you started!